At Advanced Cleaning Service in Youngsvile, North Carolina and surrounding areas, we want you to live in a healthy home. We achieve this by providing air duct cleaning, carpet cleaning, and professional dryer vent cleaning. We are also available for mold inspections and air quality tests. Prevent household fires with our professional dryer vent cleaning. The number of residential fires attributed to dryer vents is on the rise. According to the Consumer Product Safety Commission's Residential Fire Loss Estimates, "15,700 residential fires originated from dryer vents . . . $99 million in property damage resulted from these fires and 15 deaths." In 1995, that number was 13,700. Save money when you decrease clothes drying time (especially for jeans and towels) with a properly operating machine. Over time as a dryer is used, lint collects on the inside of vent walls. The larger the buildup, the greater risk of fire. We inspect all connection pieces to make sure they are properly attached and up to building codes (a maximum of 25 feet of pipe is required). Then we provide recommendations to improve your safety. Depending on your dryer type (stackable or side by side and gas or electric) and how your dryer is vented (through the wall, up through the roof, or across the inside of the ceiling), the basic cleaning procedure is the same. Our service technician unhooks the connection piece between the dryer and vent and then uses the RoVac™ system of assorted rotary brushes to clean out the entire vent and connection piece. 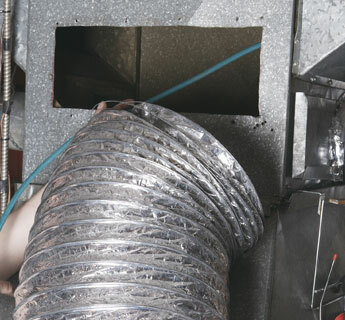 After reconnecting the vent and dryer, we recheck the vent while your dryer is operating. Use of a dryer with a dirty vent prevents hot air from freely exiting the vent, forcing the dryer to run longer than normal. Longer drying time takes more electricity and puts added stress on the appliance. We offer regular maintenance to keep your dryer vent clean and the dryer working properly.